You may have noticed the two words that I have written across various parts of my website. 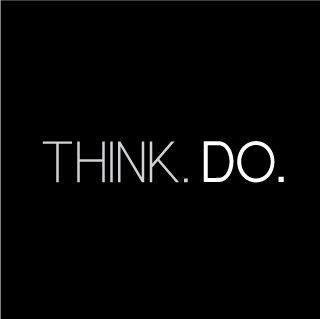 “Think.Do.” My definition of the two words are as follows. Think: “use your brain to formulate ideas and thoughts. Do: “take action and turn those thoughts into reality.” Both are amazingly simple functions that most people in the world have learned how to do between the ages of 3-6, but rarely do people truly master both. I myself am included in this bucket. It is like choosing a car route from one part of the city to the other. Think about it so you don’t get lost, but if you think too much you will never start your car. Then there are those in this world that do without thinking. They see something exciting and bright and shiny and chase it like a dog after a car. They might not catch it and forget and immediately chase another unrelated object, claiming they only ever loved that second thing. Then they find yet another. Many end up chasing the wrong car down the wrong freeway, and end up at the completely opposite side of town from where they wanted to go. Some don’t even realize it. But sometimes, doing without thinking is not the worst. There are those that do without thinking, and end up exactly (or close to) where they wanted to go. The best-case scenario is to first think, but not excessively, and then carry through and do a lot. I was impressed when I first saw it. All of these awards merely applaud his true passion and his actions. Michael Tubbs not only thinks, but also has a very acute sense of what exactly he is, what he stands for, and what he wants to get done. He doesn’t only shake his head at racial inequality with education; he tells the world and creates the SU Phoenix Project. Last year I remember Michael saying there were about 50 or 60 mentees. The other day Michael mentioned this year there are around 230. And I think Michael started another summer program recently. I think this is amazing. This isn’t just blind action; this isn’t a dog chasing cars. This is intentional, purposeful, concentrated action backed by clear purpose and reason. Michael is changing and impacting the world. Go read up on his stuff and support Michael Tubbs. Think, and Do. This is solid. Hope I could understand more of your posts.